Isaac Allred, my 4th great uncle, was born on June 28, 1813 in Nashville, Tennessee. In 1830, the Allred family moved to Monroe County, Missouri. It was there that Isaac joined the Church of Jesus Christ of Latter-day Saints. In 1834, Isaac joined Zion’s Camp, an expedition led by Joseph Smith from Ohio to Missouri to regain land from which the Mormons had been expelled. Attempts to negotiate a settlement proved unsuccessful. Similar to other Mormon settlers, Isaac and his family were driven out of Missouri to Nauvoo, Illinois and ultimately Utah. While in Utah, Isaac worked for the Church. From 1851 to 1855, Isaac served a mission to Great Britain. In 1858, Isaac and his family moved to Ephraim, Sanpete County, Utah, where his parents resided. During this time, Isaac was in charge of some sheep belonging to Thomas Ivie. On May 11, 1859, Ivie beat Isaac with a burning stick from the campfire. Isaac died the next day at Mt. Pleasant, Sanpete, Utah. He was only 45 years old. He was buried in the Spring City Cemetery, in Spring City, Sanpete County, Utah, on May 13, 1859. 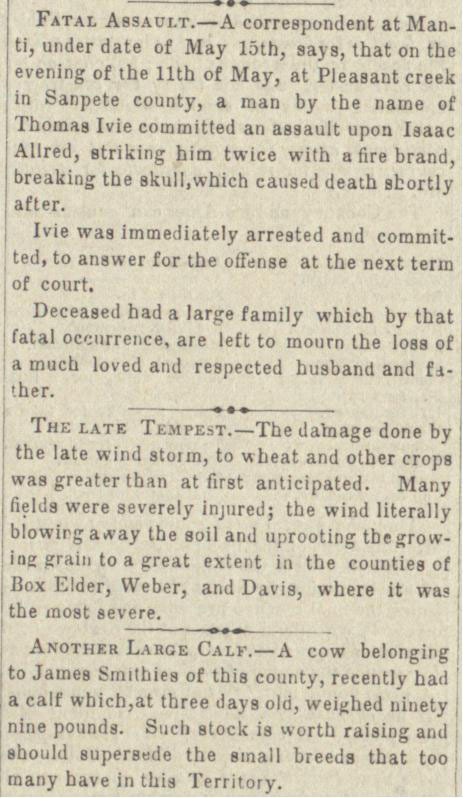 Ivie was tried for murder and condemned to death, but he managed to escape and went east.